Surprising to some, the world-renowned actor Jeff Goldblum, possibly best-known for his role in Jurassic Park, is also an accomplished pianist. The jazz pianist and his orchestra, The Mildred Snitzer Orchestra, regularly play together. 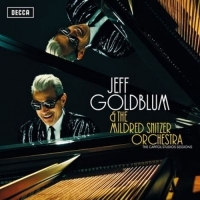 Goldblum has signed with Decca and releases his debut album featuring guest artists Sarah Silverman, Haley Reinhart, Till Bronner, and Imelda May. The repertoire includes '60s jazz standards "Cantaloupe Island" and "I Wish I Knew How It Feels To Be Free", the 1940s classic "Straighten Up and Fly Right" with guest vocals from Irish superstar singer/songwriter Imelda May, the 1920's song "Me and My Shadow" sung by Sarah Silverman as well as Caravan and more.